How to Completely uninstall a Software ? You are here: Home / Tutorial / How to Completely uninstall a Software ? My Friends asked me after uninstalling a Software my Windows Xp causes many Troubles.What to do? What actually Causes the Problem ? Ok,First Lets see What actually Happens when we install a Software? When we install a Software it Copies Some of its Files usually in C:\Program Files , C:\Windows\System32 , Registry .If we uninstall a Software from Add/Remove Program ( Win+R –> appwiz.cpl).It removes some Files from C:\program Files only.It will not remove the Softwares Supporting Files and Folders from System32 or Registry. I use a small Freeware utility called Revounistaller for this Process. Revo Uninstaller helps you to uninstall and remove unwanted programs installed on your computer even if you have problems uninstalling and cannot uninstall them from “Windows Add or Remove Programs” control panel applet. Revo Uninstaller is a much faster and more powerful alternative to “Windows Add or Remove Programs” applet! With its advanced and fast algorithm,Revo Uninstaller analyzes an application’s data before uninstall and scans after you uninstall an application. After the program’s regular uninstaller runs, you can remove additional unnecessary files, folders and registry keys that are usually left over on your computer. Even if you have a broken installation, Revo Uninstaller scans for an application’s data on your hard disk drives and in the Windows registry and shows all found files, folders and registry keys so you can delete them. With its unique “Hunter mode”, Revo Uninstaller offers you some simple, easy to use, but effective and powerful approaches to manage (uninstall, stop, delete, disable from auto starting) and to get information about your installed and/or running programs. Using this Utilitiy is Easy.Here am i going to Show how to uninstall Broken FolderLock for Newbies. 3.A dialog box will open. Select Advanced Mode –>Next. 6.After that the revounistaller will search for Leftover information.Click Next. 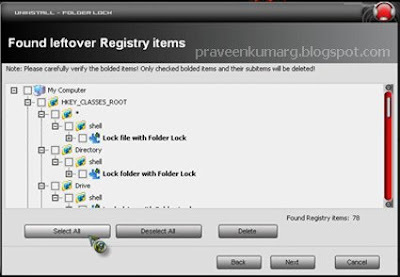 7.Now it will show Leftover Registry Items.Click Select all –>Delete. Click Next. 8.Now revounistaller will display Leftover Files and Folders.click Select all –>Delete. 9.That’s it.Now your Pc will be Completely free from unwanted Softwares,Registry,Files & Folders.